Note: Best viewed with IE 11+. See bottom of page for links. We Love Our Country!!! God Bless America!!! and win a FREE membership or race entry! Please have your car quite so we can continue to respect our event sites and the neighboring areas. It's about a nine hour drive from Eugene to Merritt British Columbia, and that doesn't account for food stops, gas stops, traffic, or delays at the border crossing. Now you might be wondering why anyone would chose to drive from Eugene to Merritt in early February, the answer is the Thunderbird Rally. The first Thunderbird Rally was in 1957. 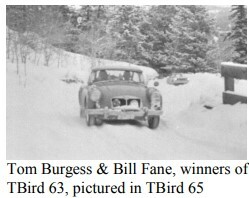 In 1963 the event was won by the team of Tom Burgess and William Fane in an MGA. Imagine the adventure of flinging a two wheel drive, rear drive, barely heated, MGA down frozen snow covered roads! That spirit of adventure continues with the modern Thunderbird Rally. The 2019 event got going with registration and tech inspection Friday evening in Merritt followed by an optional Novice orientation. 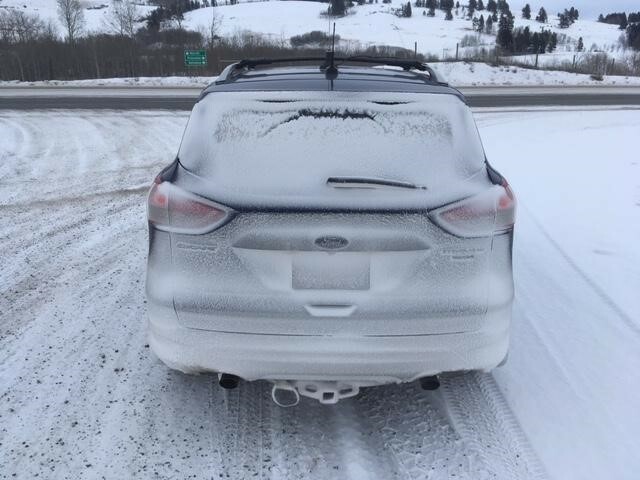 The Rally is a Time Speed Distance (TSD) rally that calls for a team of driver and navigator to maintain prescribed average speeds on the snow covered, but mostly plowed, back roads of British Columbia. Teams pass checkpoints along the route and are given a penalty point per second they are early, or late. The 2019 event presented teams with 18 checkpoints on Saturday as teams made their way from Merritt to Penticton. Sunday presented teams with 12 checkpoints as they returned to Merritt for the awards and sharing of stories, some of which were true. My experience with the 2019 started with a call from my navigator Bill letting me know that he had a commitment Thursday evening in Albany and the earliest we could leave his place on Thursday would be about 9pm. Thinking we'd rather sleep in our own beds we decide to leave early Friday morning. I left Eugene at 5am and picked up Bill in Salem at 6am. Since we were taking my Ford Escape that we hadn't rallied in before, and I hadn't yet drove in the snow, we wanted to get to Merritt while it was still light and get some practice in. This all seemed like a reasonable plan, but then we started hearing the weather forecasters calling for snow in western Washington. They were calling for snow to reach Seattle around noon, but also calling for snow to reach Bellingham at 8am. We figured we would probably get thru Seattle before hitting snow. 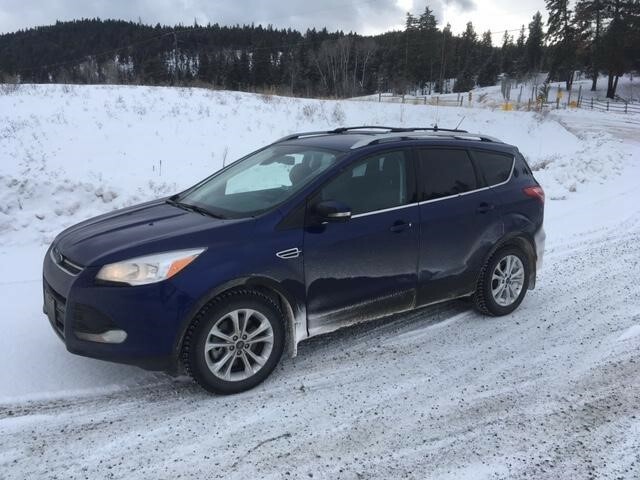 I had shod the Escape with a brand new set of Nokian Hakkapeliitta 9 studded snow tires, so we were more concerned that traffic would impede our ability to get to Merritt than we were about being able to drive the route ourselves. As it turned out we did run into snow North of Seattle, but just as we were resigning ourselves to a long slow haul to Merritt, conditions improved and we had bare pavement most of the rest of the drive. We arrived in Merritt in time to get in two stages of practice before the sun went down. Feeling more comfortable with the car and flushing out the cobwebs between our ears on how to play the rally game, and how to operate the Timewise 798 rally computer. We checked into the hotel and headed to registration and tech inspection which went smoothly, as it always does due to the great organizers and event officials. We then joined two other Oregon teams and headed to the Grand Pub & Grill for their "two for one" steak dinner. Saturday morning we ran some calculations thru our excel spreadsheet and reviewed the routebook for cautions and other things we wanted to watch for. We headed out at our assigned outtime. The day went pretty well, but I noticed if I got into a corner of deeper snow and tried to power out of it, the car had no power and would have significant delay before the power finally came on. After about three stages we figured out how to disable the traction control and this problem went away. Unfortunately there had been a landslide on one of the main highways in the area and traffic was detoured onto some of the back roads the event organizers had planned to use. It's not realistic to expect rally teams to maintain average speeds in traffic so some parts of the event became unusable, but Route Master Paul Westwick and his team did an outstanding job of making the needed modifications on the fly and keeping the teams informed. After the final stage, that was run in the dark, teams straggled into Penticton for a well deserved frosty beverage and an overnight stay. Sunday morning we learned that we had 41 seconds or error over the 18 checkpoint on Saturday which placed us 9th overall. The first place car had 8 points on Saturday, but more about that later. The day brought more plowed roads that weren't as challenging as Saturday's roads, but enjoyable none the less. At one point on Sunday the Escape was telling us it was two below zero. We also passed a frozen lake that had a hot spring boiling up thru the ice, that was a neat sight. After scores were tabulated on Sunday we learned we had a total of 49 seconds of error for the entire event, putting us in 9th overall. I was extremely impressed with the first place team of Garth Ankeny and Russ Kraushaar who had a total of 13 seconds of error for the event. Russ is a bit of a wizard when it comes to operating an rally computer, but the score, and Garth's driving, is even more impressive when you learn they were in a 1966 Ford Cortina GT, which is a two wheel drive, rear drive, barely heated vehicle harkening back to the Thunderbird rallys of yore. While not quite the adventure of the Thunderbird Rally, the Emerald Empire Sports Car Club is presenting the Emerald Empire TSD Rally on May 4th. Check the www.EESCC.org website for details. If you are having problems viewing this site, please update your software from the following companies. Comments, suggestions, or items you would like to see on this site contact: Tim Steck, EESCC webmaster.